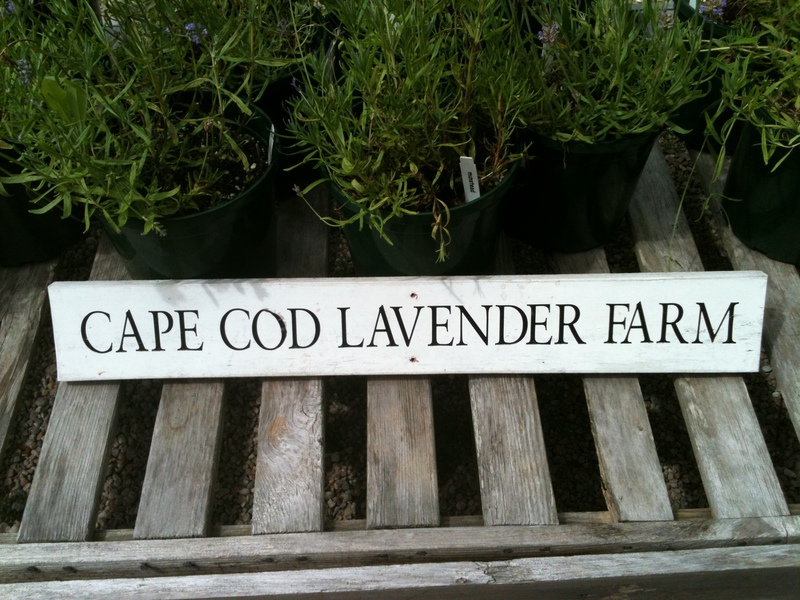 A visit to Cape Cod Lavender Farm is an awfully good way to start celebrating our 40th wedding anniversary and the beginning of life full time on the Cape. The farm is owned by a couple who work it every day. 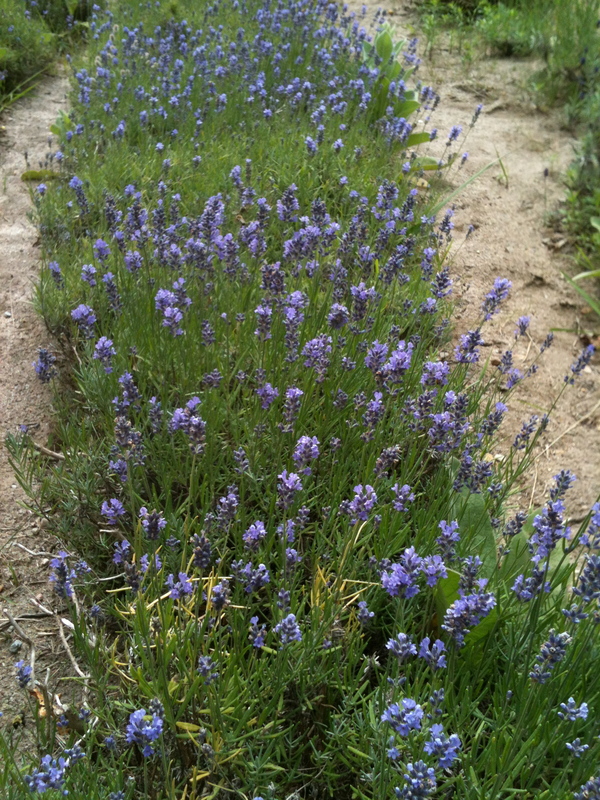 They have more than 10,000 fragrant, lovely lavender plants on twelve acres of peace and quiet. Up close the purple spikes look dainty, yet strong. 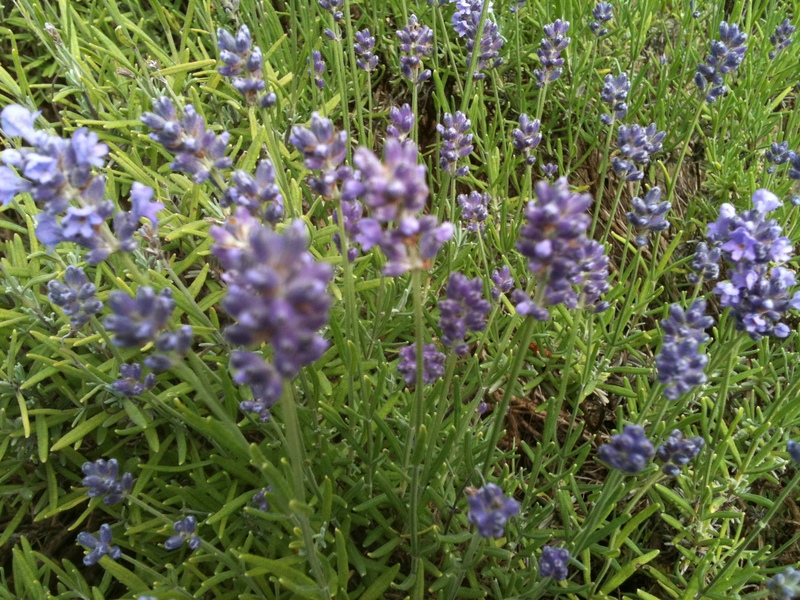 They sway in the breeze, and the fragrance is gentle and subtle. 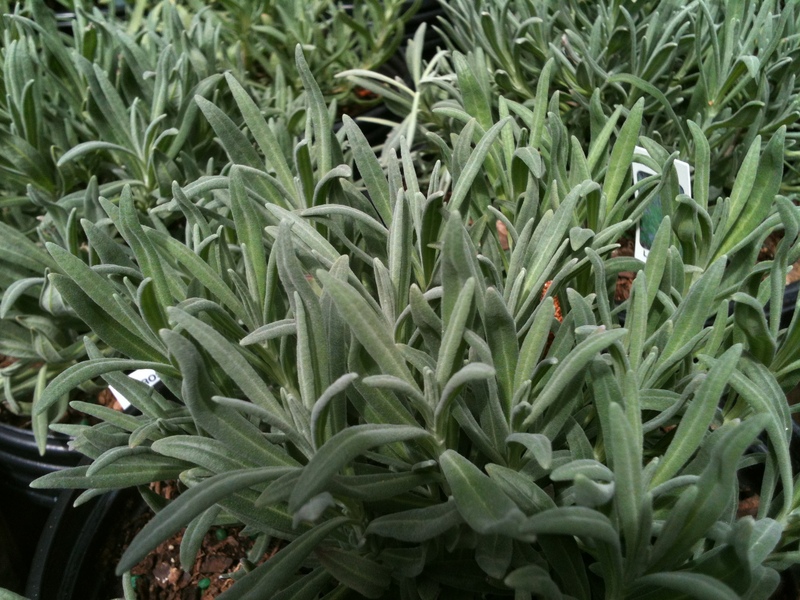 The rows are bushy and reveal the different varieties–a spectrum of color and leaf structure. It all smells so good. We had an opportunity to talk to the owners, Cynthia and Matthew Sutphin, and it was clear that this farm is a labor of love. Every day there is toil and joy. There are money problems, weather issues, and Mother Nature delivering her best and her worst. There is a simple and honest theme at this place. Nothing is gussied up; there are no artificial additives to the view or the product. It’s remarkable refreshing. 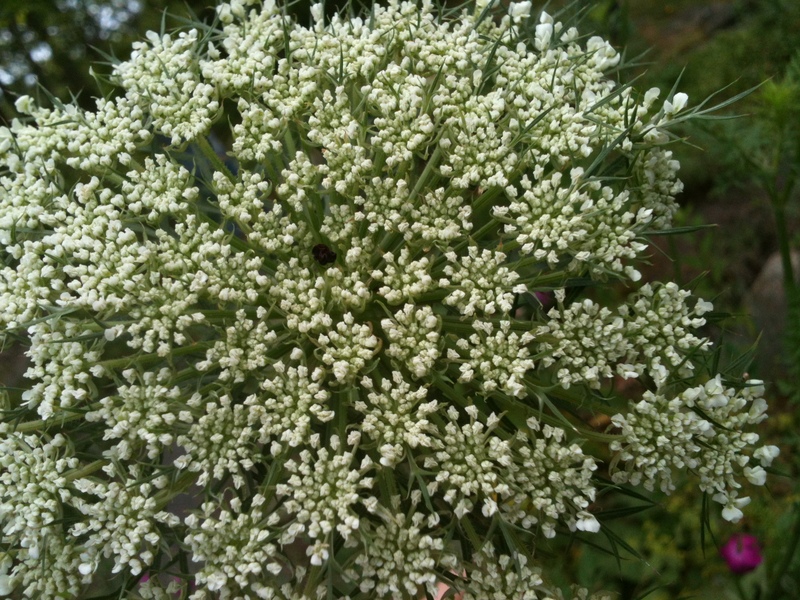 The Queen’s Ann Lace borders a small garden. Its delicate form reminds me of a lace shawl I’m working on. Art does imitates nature. 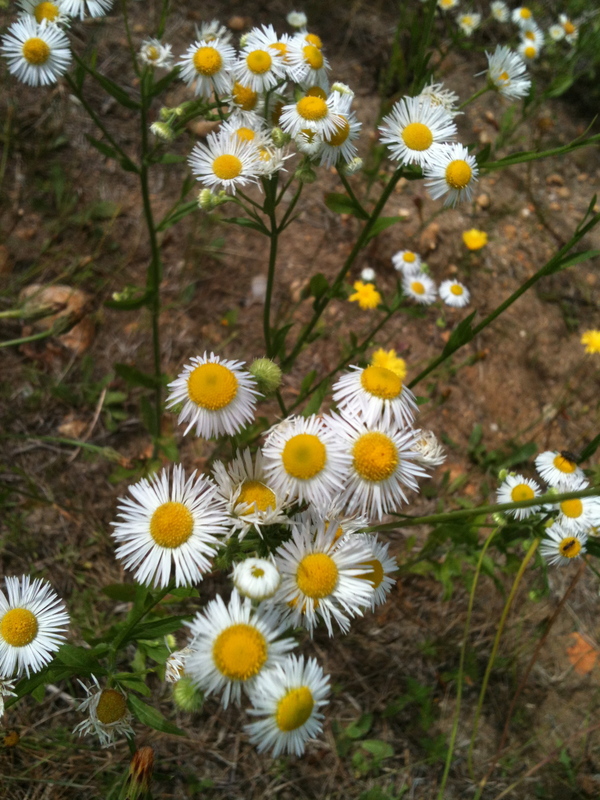 Even the weeds look pretty in their own way. I’m sure there are lots of lessons here that correlate to being married for forty years, but right now I’m going to have a bowl of yummy strawberries and raspberries with my groom..
My difference became the norm for me. 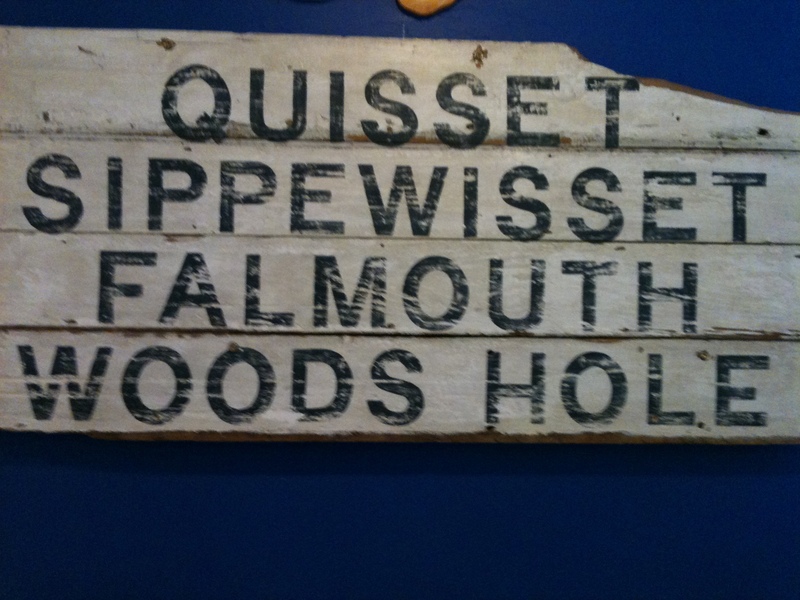 Now, for the first time in a very long time, I’m living somewhere permanently where I feel like I fit: Falmouth. It is an absolutely delightful, refreshing, happy feeling. At 10 am, the streets are “just full enough” of people with kids and dogs in tow. The shops are open and each has a garden set in the sidewalk that is in full bloom. Nobody has a cell phone attached to his/her ear, and nobody pushes or bumps into us. People smile and say hello. They make conversation. I feel like I’ve died and gone to heaven. 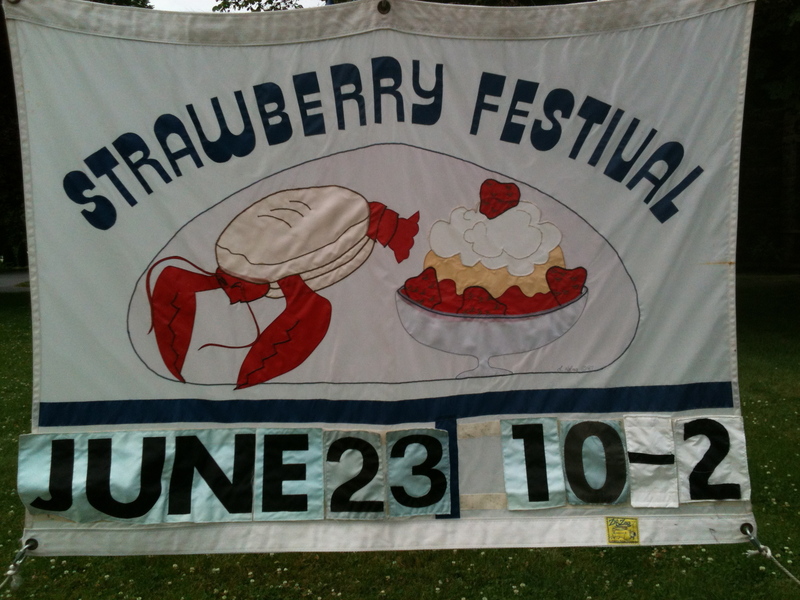 The first stop is the Strawberry Festival at St. Barnabas. 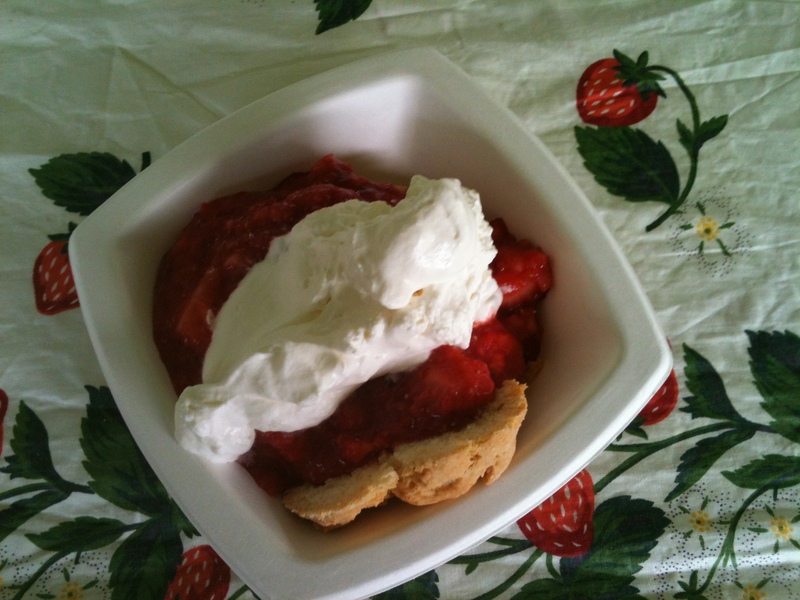 I confess, I ate the most delicious serving of strawberry shortcake, complete with extra whipped cream at 10 am this morning. Well—it does contain fresh fruit, dairy and wheat! David, on the other hand, starts off the morning with a hot dog followed by his even larger portion of shortcake. People ask how we like it, comment on the gorgeous red color against the white cream, and ask where to get some of their own. Young couples with little ones in buggies or held by hand mingled with the gray hair set. I play with one baby while her mom sells tickets; while chatting I learn that the baby was a preemie and is thriving. I just finished knitting hats for the preemies at Falmouth Hospital, and the mom told me how she will forever remember the little preemie hat that her baby wore when she was first born and in the NIU. Teens make the rounds in their own broods, but actually make eye contact with the rest of the world and say hello. It is a melting pot filled with pleasant people, great food and all kinds of stuff for sale. A book table is full to the brim with recent publications donated by townspeople and sell for a dollar or two; customers are two layers deep and everyone is gabbing (not grabbing!) about what book they particularly enjoy. An antique linen table is filled with, you guessed it, your grandmother’s linen closet goodies; handmade lace, lots of embroidery and exquisite cut work are on display. Folks chat about how they once had a tablecloth like that… and who spilled the wine on it. We stroll through the tent with all kinds of recycled treasures and promise to return for a lobster roll on the way back to the car. Onwards a few blocks to the Arts Alive celebration in front of the library. 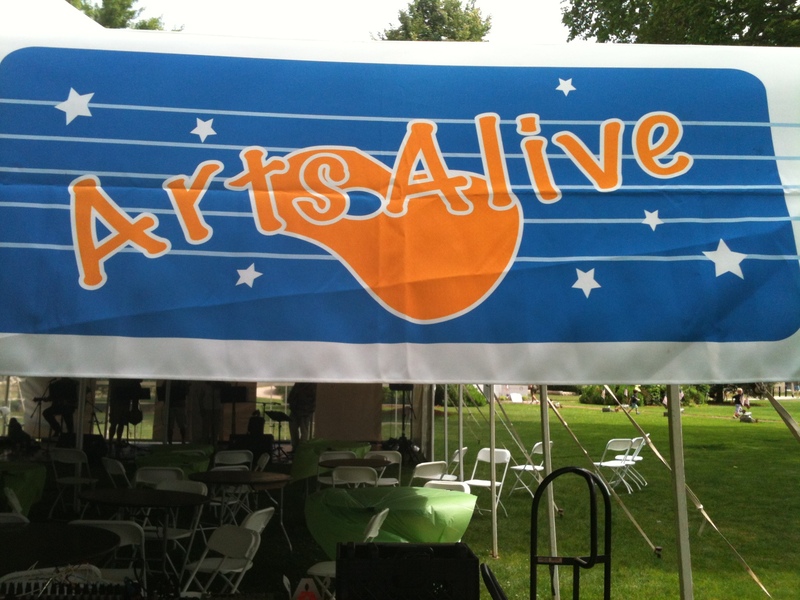 Here we find live music, more yummy food, and a vast assortment of creative artwork. 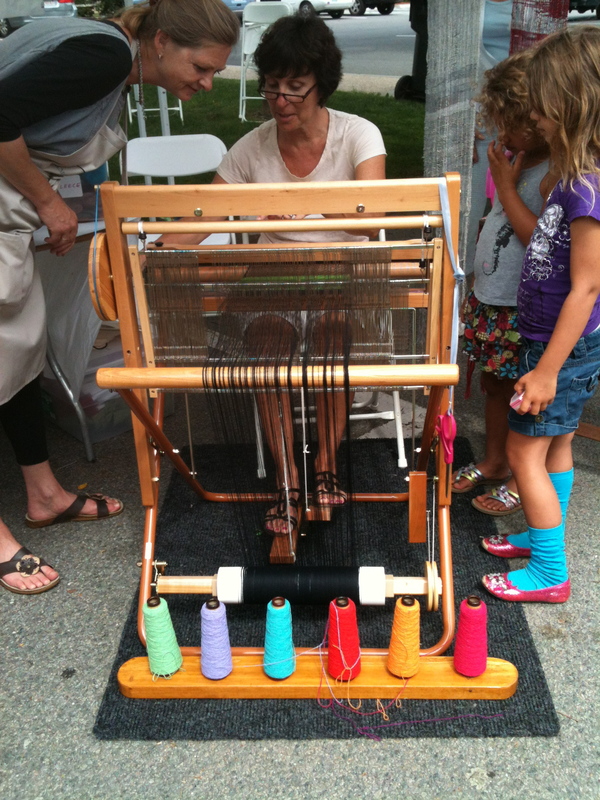 The folks who man the Falmouth Art Center booth have a loom set up and invite all to take part in Free Form Weaving. A basket of fiber is nearby and someone else is spinning while a third person is knitting a gorgeous shawl. They talk about what they were making AND ask what sort of fiber work I do. We swap information about types of yarn and patterns… and I learn that this is an organization I really want to belong to asap. 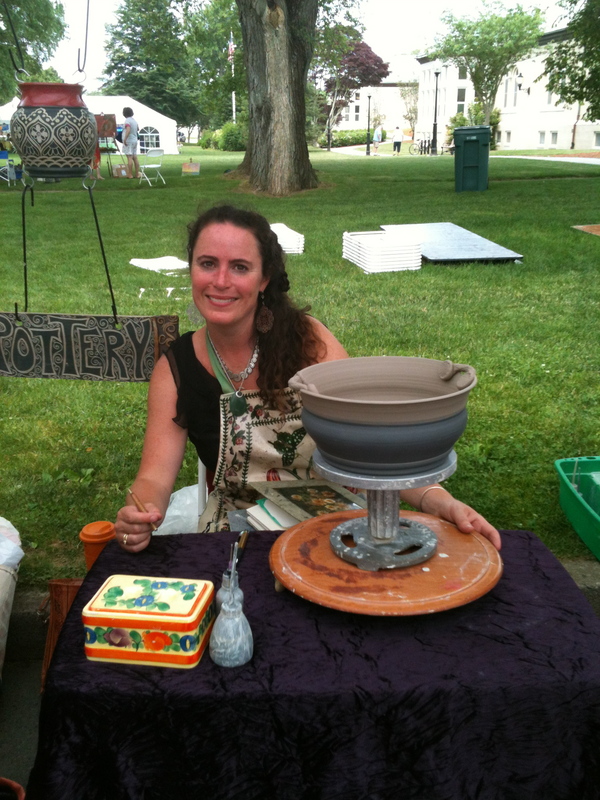 There is a potter, complete with her wheel, working on a beautiful bowl. The expression on her face proves that she loves her work. A spinner has her wheel in full swing and her artsy hand spun yarn with thick and thin bobbles is so lovely that it could be worn as a necklace. Another woman is knitting mittens with yarn she dyed using natural products; the colors are rich and unique. I want them! We find the photographer who took our family photos years ago. As we are telling her how she so wonderfully captured us on the beach, another couple pipes up that she also took her wedding photographs fifteen years ago. She, too, captured their essence. I could go on and on, but you get the picture. Today I found a lot of creativity, nice people, a real sense of community, and a place I’m happy to call home. There’s something exciting about putting small things together to make something grander. I’ve been doing that as a quilter for thirty years. Buy yards of gorgeous fabric, cut it into little pieces, then sew the tiny pieces together to make a work of art that happens to keep you warm or look interesting on the wall. 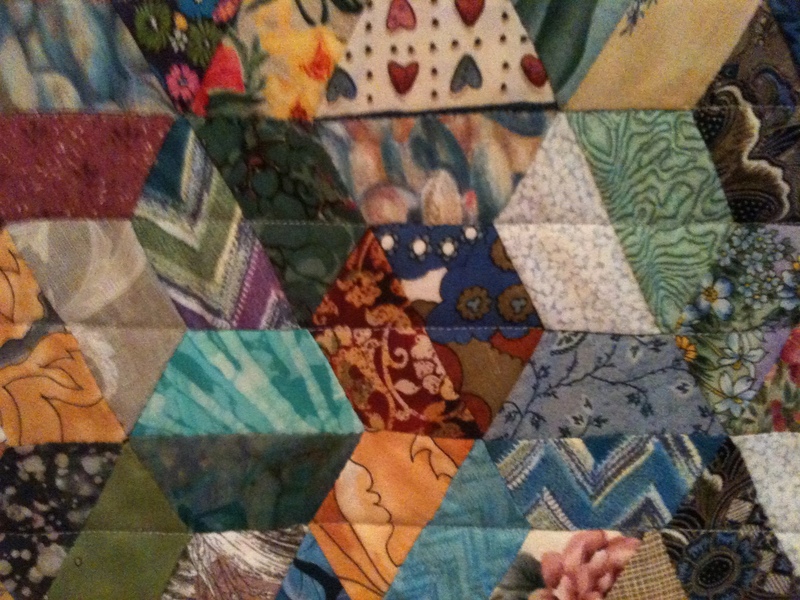 I’ve made traditional quilts and art quilts—and the process is always surprising. I often think I know what I want the end product to look like, but it’s not predetermined and something is always left to my imagination’s spin cycle. 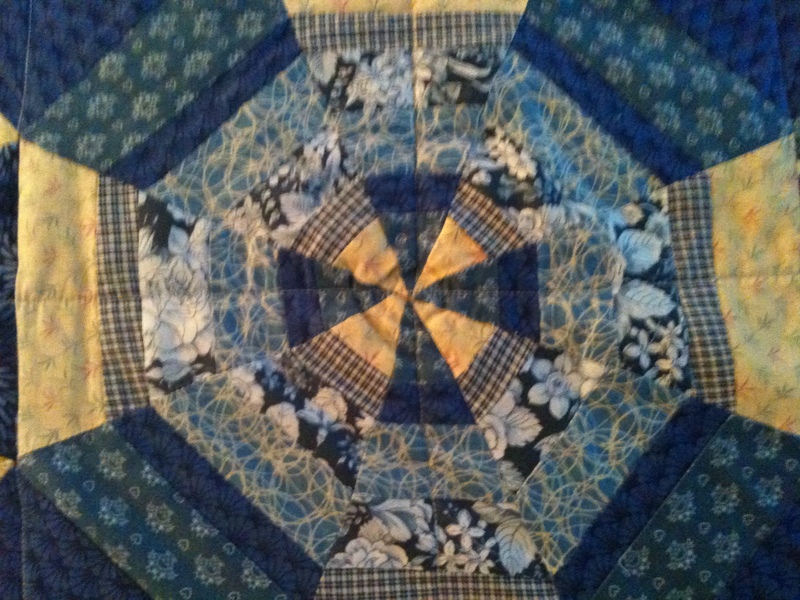 Once I thought I wanted to make a traditional blue and white string quilt; half way through it, a piece of yellow fabric happened to fall on the floor where I was laying out the quilt. The yellow was an absolutely glorious addition; it made the blues bluer and the whites crisper. It pops, and I smile every time I crawl under it. It has had its place of honor in the master bedroom for years. There was also a piece of kimono fabric that was so precious I couldn’t bear to cut it up. One brave day, who knows why, but I closed my eyes, yielded my rotary cutter, and slashed that fabric into really unusual curvy pieces. 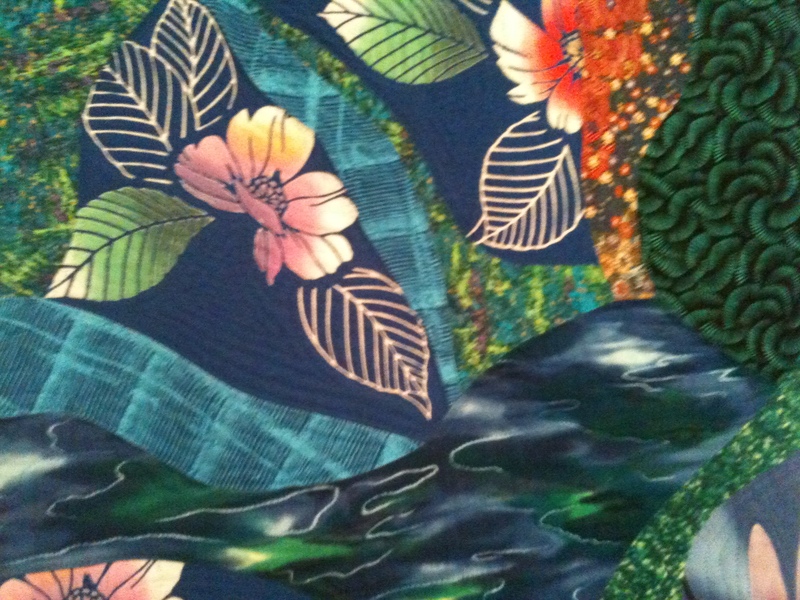 I did the same with some additional fabric and merged it all into one swirling, soothing water scene. Before then I had never sewn curves before. Who knew?! 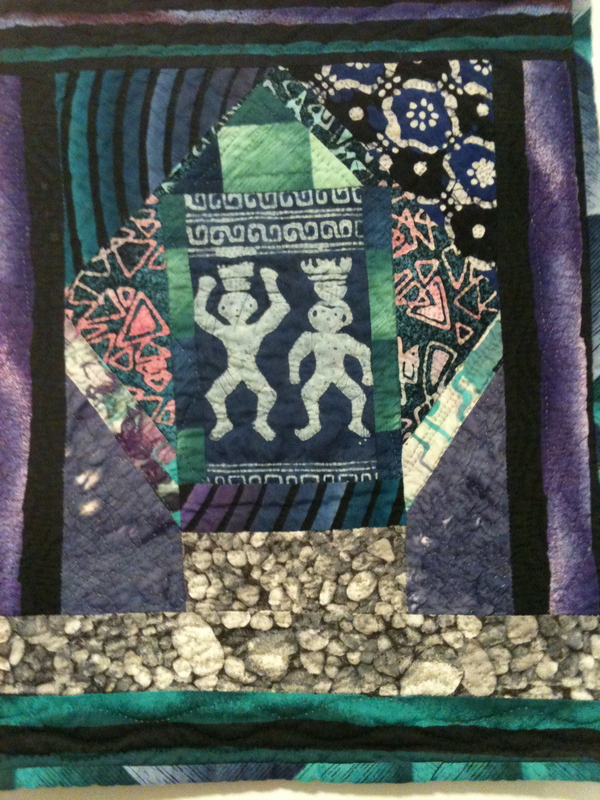 My art quilts are most often created by pulling odds and ends out of my scrap pile. Out of “nothing” comes something… that’s what’s so exciting for me. The juxtaposition of one fabric against another creates a whole that is greater than the sum of the parts. Before I know it, I’ve constructed a cloth door that opens into some kind of magical world. It makes my heart leap up—every single time. I notice that I do something similar when I’m playing with a poem or piece of writing. Several seemingly random thoughts bounce off of each other. They set off sparks and ignite more ideas, and it grows into something bigger and hopefully something that makes me think beyond the obvious. When reading other authors’ writing, I look at the small details: word choice, punctuation, sentence structure, voice. How does each contribute or fail to contribute in sending a message or creating a work of art. I don’t “sweat the small stuff”, but I do enjoy it. It takes me to far away places with grand views that I would have otherwise missed. Posted in create, Uncategorized. Bookmark the permalink. That’s one of the golden rules I was taught to obey. It is a double-edged sword: one that brings victory and success…and also causes various degrees of self-inflicted wounds. The motivation to improve oneself and follow a serious work ethic is laudatory on many levels. It encourages personal growth, intellectual curiosity and a commitment to one’s passion. This means pushing beyond what is easy and what is obvious. The downside is that it can lead to self-absorption, compulsions, and a lack of balance in life. It reminds me of Lily Tomlin’s observation that if you win the rat race, you’re still a rat. That’s probably not very fair. There are lots of nice mice in that race, trying to find who moved the cheese. I really don’t want to label all of the winners as rats. This dilemma comes into play when thinking about the proverbial American Dream. Be ALL that you can be. Success is there if you work hard and work smart. This is the land of opportunity. Yet, today, so many successful business people are tarred and feathered because of their success. While I was growing up, it was the lazy, mediocre, non-passionate ones that were criticized. We were encouraged to work hard and get on the “Honor Roll” and strive to place high in class ranking. 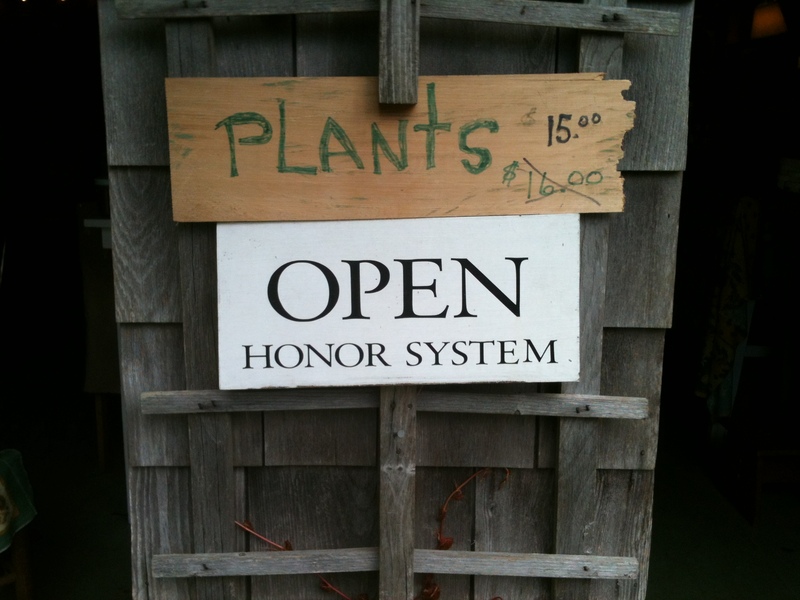 Today, some schools no longer have honor rolls, class rank, valedictorians or achievement awards. Everybody is told they’re special, no distinctions are made for accomplishment or achievement. Has the pendulum swung too far? If everyone is special, then “special” is the new average. Is that what we want –mediocrity that thinks it’s great? As a teacher, I believe that all students are capable of improving, and should get their just reward. But just showing up shouldn’t result in a “Gentleman’s A”—that is a disservice to all. The downside of the “good, better, best” mentality is not knowing when a task deserves to be done using 75% of one’s capacity, instead of 150% in overkill. When is the drive to do more and to do better creating a terrific quality of life or destroying it? Because of my being the first child, surviving Catholic school and always being fully energized to do my best, I’m probably not the best person to ask for advice on this question. It comes naturally to me to work at 300% and deliver more than expected. It’s not always a healthy or wise process—there’s always a struggle for balance. I discovered it is easier to learn to tamp it down versus ramping it up… but that’s probably my Type A personality peaking or peeking through. I just finished reading The Art Of Fielding by Chad Harbach and the main character deals with having and then losing an award winning performance record on the baseball field. He had absolutely no fielding errors… and then he made mistakes and fell apart. His demand for perfection ruined his possibilities. He couldn’t cope with the errors and slipped into despair. Other characters in book likewise deal with straining to be perfect, losing their bearings, and then trying to find a way to re-construct a more meaningful life. Perfection is clearly the enemy in this book. Being perfect somehow means lacking the skills to cope with failure. I always used to tell my students that I learned far more from my failures than from my successes. I believe that to be true, not because it takes the sting and stink out of losing, but because it teaches me something. Posted in teach. Bookmark the permalink. I just finished reading The Art of Fielding by Chad Harbach; it’s about baseball, but really about life. Also, Father’s Day is next week and my head is flooded with great memories of my dad. So that’s the genesis of this post. My next post will focus specifically on Harbach’s book; I really liked it! I was the only girl and always the last one picked. When I got up at bat, I had no idea what I was doing or how to do it. The third pitch arrived, and you guessed it, “Strike Three, You’re OUT”. All I heard was that I was “out”, and I thought it meant I was thrown out of the game (again more evidence of my complete lack of understanding). I immediately ran home in tears. The boys didn’t know quite what to do. They scratched their heads, or whatever, and continued to play. My red eyes and sad face were noticed by my dad who asked what was up. He wisely asked me to tell him EXACTLY what happened, including quotes from the boys. After my muddled explanation, his green eyes lit up in laughter, “Oh, you struck out!” I immediately replied, “Dad, I didn’t strike anyone—they threw me out because I can’t hit the ball.” He explained that “OUT” was not expulsion. This episode began my new relationship with the game. Dad grabbed a wiffle ball and bat and for weeks he taught me not to make a fool of myself on the diamond. In the backyard, where no one could see me, he pitched and coached me until I could hit and sometimes even catch the ball. He was a determined, hopeful, kind soul. Thereafter I could count on hitting the ball most of the time. The boys let me play, and I wasn’t the last one picked any more. Years later, an organization of New England Commercial Real Estate professionals held its annual picnic at a woodsy country club and thought it would be a great idea if we had a friendly game of softball. I thought I was going to die… play ball with all of these folks I did business with on a regular basis. Oh, the potential embarrassment and indignity of it all. If I refused, I looked like a prissy sissy. If I struck out, I looked like a fool. So, this time, my patient husband (the physicist) held practice sessions in the back yard. He talked about the trajectory and the angles and the spin of the ball. I just wanted to hit the damn thing and run like hell. It all worked out well. I hit a home run; everyone was shocked. This kid finally got to feel the thrill of the bat and ball connecting and having everyone look up to the sky. Posted in exercise. Bookmark the permalink. I’ve taught every grade from kindergarten to university. It was never “just a job”—it actually was a way of life. Both the content and pedagogy were always churning and fermenting in my brain. I was always on the hunt for something fabulous/interesting/curious/confusing to bring up in class. It was a most delightful, challenging mind game that always kept me busy, growing, and entertained. It’s true, that for me, being a teacher meant being a perpetual learner; that was many of the rewards granted daily. And, of course, there are the students! Every semester I’d meet and greet new members of the Tetreault gang; many would be in the flock forever. Together we overcame challenges: me finding a way to reach them and them working hard to meet our goals. I do miss the look on a student’s face when s/he “gets it”. That’s the moment when the value of brainstorming is realized, or perhaps the recognition of an author’s strategy in writing an essay or maybe it’s a connection to the student’s life. Those “eye-openers” made my heart sing. When I first started teaching, I remember a high school student who just finished reading The Great Gatsby, ask me, “I want more of this. Did this guy, Fitzgerald, write anything else?” Ahhhh, the beginning of a beautiful friendship! Just a few weeks ago I got an e-mail from a former high school student of mine from ten years ago. He wrote to celebrate that he just got his first professional journal article published, and he thanked me. I blubbered! Teaching is the gift that keeps on giving. I regularly get e-mails or phone calls from former students just checking in. They let me know what they’re doing, reading or thinking about, and they want to know what I’m up to. Grad school recommendation forms and job references are the norm. There’s always a request for some book suggestions— especially from kids that previously didn’t consider themselves readers. They all are quick to share their latest written treasure or flop. I’m grateful that this aspect of teaching continues, because it really is a joy. On my one-year anniversary away from the classroom, I can say that life does go on. I miss the intellectual stimulation of classes, but have replaced that with lots of eclectic reading, long conversations with David, and writing this blog. I’m also always seeking other venues that provide access to new ideas and dialogue. There are lots of opportunities to do this at brick and mortar sites as well as on line. My mind is still going a mile a minute. For the first several months of retirement, I did miss the rhythm and drumbeat of the semester. First day excitement; the “getting to know you” honeymoon period, five critical essays staggered throughout the semester, and the closure at year’s end. At 8:30 am I’d wonder what my Expository Writing class was up to— and during the first week of May I did a double take about the urgency of getting grades done and submitted on time. But that pace is being replaced by my own schedule now. I get up a wee bit later than when I was teaching and have a short list of tasks I want to accomplish. I’m the starter and the pace car and the racecar. It’s all good—the memories and the new life.